Microweber is one of the firsts drag and drop website builders and content management systems CMS. Drag any element anywhere on your website, online store or blog and just drop it to give your website the look and feel you want. Drag & Drop applies to all types of content like - images, text fields, videos, layouts and the whole variety of modules and additional customization options. ‌How the drag and drop works? Drag and Drop save you a huge amount of time and makes creating your website unmatched intuitive user experience. Managing and rearranging your content is now a matter of seconds now. Let`s get for example the Dream template, which is the defauth template on Microweber website builder and CMS. The template contains more than 75 pre-pared layouts, ready for use. They are optimized also to work perfectly on mobile devices. However, there are few tricks that you need to know for perfect results using the drag and drip technologies. 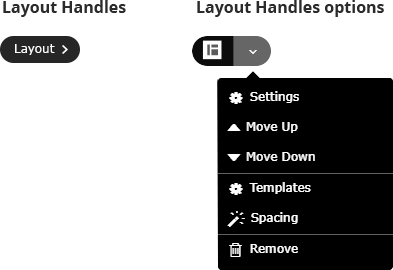 From the sidebar menu in the Live Edit, you are able to use all draggable elements. The first tab contains each layout that the current template have. Each template has own layouts. This default template called Dream contains more than 75+ layouts. The second tab is for the Modules. We have prepared more than 60+ modules that comes by default and for free with each installation. If you want to drag and drop - modules and they look perfect you should need to use first the clean container. 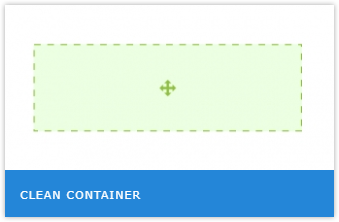 This “smart” layout clean container fits into the grids of your website! If you are using it your content will be arranged in the best way and will look perfect. We have a few types of handles. Small Handles which appears and helps you to work with text and headings. When you put the mouse on the drag and drop element, you will see the arrow which leads you to the settings menu. Here is a very short animation of how the small handles work below. Learn how to make drag and drop in a proper way in Microweber. We have prepared some useful video lessons and tutorials in Microweber Academy.